There is a large number of hash types. Some of them are universal and are used by a wide range of applications, for example, MD5, SHA1, CRC8 and others. Some hashes are used only in certain applications (MySQL, vBulletin) and protocols. In addition to popular hashes, developers can use different combinations of universal hashes (for example, compute an MD5 hash and then send the result string to SHA1 function), or iterated hashes (for example, MD5 hash is calculated for the password, then the MD5 hash is recalculated for the result string, then MD5 is calculated for the next result string and so on a thousand times). With regard to the cracking, sometimes a string or a file that is formed in a certain way is called a hash. This hash is not used by the target application, but it was calculated from the source data and it allows you to crack the password of the target file or protocol. Usually a penetration tester knows the source of a hash and he knows its type. But there are exceptions. In this situation, it is necessary to ‘guess’ what kind of hashes we got. This can be done by comparing a source hash with samples. Either based on the number of characters and the character set used. You can also use tools that greatly accelerate this process. Programs to identify the type of hash are hashID and HashTag. By default, this program is already installed in Kali Linux. It identifies the different types of hashes used to encrypt data, primarily passwords. hashID is a tool written in Python 3, it supports the identification of more than 220 unique types of hashes via regular expressions. Hashcat hash modes is a hash type that you must specify with the -m/--hash-type option,. As you can see from the screenshot, it's Drupal> v7.x in Hashcat to crack this hash, you need to specify 7900 mode. MD5cryp is an algorithm that calls a thousand times the standard MD5, to complicate the process. The program says it's SHA-512 Crypt - i.e. SHA512 (Unix). 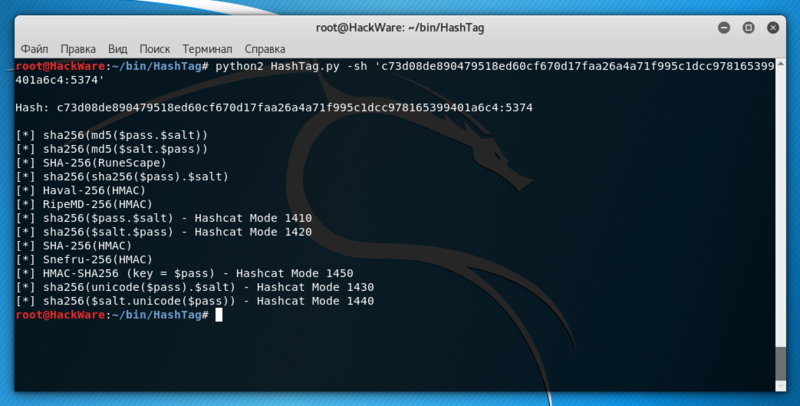 HashTag is a python tool that parses and identifies various password hashes based on their type. HashTag supports the definition of more than 250 hash types and maps them to more than 110 hashcat modes. HashTag is able to identify a single hash, parse a single file and determine the hashes inside it or traverses a directory and all subdirectories to look for potential hash files and identify all the hashes found. Therefore, it is similar to the previous program. A hash for HashTag also need to be placed in single quotes. You need to write a hash after the -sh option. But modes are displayed without additional options. As you can see, the results are similar. A large number of classic hashes, as well as hashes, specially designed for hacking passwords and hash files you can find here. The hashID and HashTag programs do not always correctly identify the hash (at least in the obvious errors hashID is noticed). This is obviously an erroneous result, since the salt after the colon was discarded when the hash was identified. In fact, this is sha256($pass.$salt).